Many people will be surprised to learn that diet can significantly affect our mood and how we respond to certain situations. It can even contribute to the amount of anger we feel and how we manage this anger. It is no secret that our diet can influence practically any aspect of our life and the incidence of anger is no exception. Experts have now established links between what we eat and the anger we experience. Foods that are high in sugars can cause our blood sugar to soar and then crash very quickly. This can induce irritability in people who are not angry before eating, and can increase the severity and coping mechanisms of those who continually deal with anger. Avoid eating these types of foods and try keeping our blood sugars at a fairly constant level. This can be achieved by eating smaller but more frequent meals made up of proteins and carbohydrates that are released slowly into the blood and will prevent acute peaks in blood sugar. There is also evidence that binge eating or eating large meals affects how irritable and frustrated we become. This is because large portions, especially if they are eaten quickly can cause an accumulation of gas in the gut. This not only makes us feel lethargic and de-motivated, but can also be uncomfortable leading us to be more susceptible to losing our temper more quickly. It is so easy to become annoyed at yourself when you are following a diet plan. Whether it is because you have lapsed and feel disheartened and disappointed at yourself or because you feel hard done to and deprived of the things that you enjoy the most. If you are the type of person who feels as though you’re missing out and are getting angry at having to follow a plan the chances are you are not on the right diet plan for your needs. There are so many diets around that it should be possible to find one that suits you. Try one that allows for ‘sins’ or treats from saved points as this may help ease your symptoms. If you are struggling to follow the plan because of its restraints, it is likely that you need to find a plan that can be tailored to your lifestyle and timetable. Many of us cannot follow a strict plan because of time or schedule but there are some available that can be flexible. If need be, find out if there are any supplements or special snacks you can take that will help you stick to your diet so that you are not worrying about your health or sticking to the plan. When you are feeling annoyed remember why you want to diet in the first place. Keep telling yourself you can do it but try not to let a diet become the focal point of your life as you will give it too much emphasis. Remember: we eat to live not live to eat. Food should accompany our life not be the centre of our day. 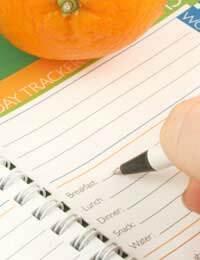 If you feel your diet is affecting your anger levels it may be beneficial to keep a food and mood diary. This log of information may help you detect any circumstances in which an outburst or incidence of anger has been exacerbated by certain foods or food groups. Only by keeping a log will you be able to spot any patterns of behaviour and the trigger that caused it. It isn’t very difficult to see how our diet might influence our mood and our anger. If we are finding it difficult sticking to a planned diet or we are making our anger worse by eating the wrong foods, there may be ways of adapting our behaviours and nutritional intake to make us feel calmer and less agitated.